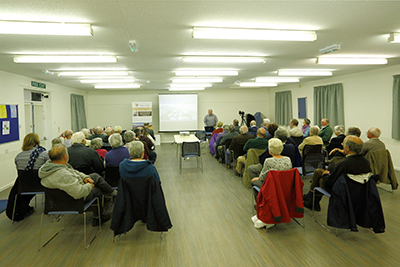 On Monday 24th April the Club hosted the long awaited and re-scheduled visit by professional photographer, Don Bishop ARPS. Don was making his fifth appearance in Minehead and this years presentation was entitled "Hebredian Light" a photographic trip he and wife Jane had taken on several occasions to the Scottish Isles. Our journey began on the Isle of Lewis with it's white sandy beaches and old Blackhouses, or Crofts. On into Harris with it's impressive mountains also fine white beaches and turquoise waters in the south west of the island. A short trip by ferry and you are on North and South Uist, after travelling the length of the island, another ferry crossing was made from Eriskay to Barra and Vatersay before crossing to Iona and Mull and eventually arriving in Oban. Many interesting places were visited on the way, such as the derelict boats at Salen and the coloured fishermen's cottages in Tobermoray. Some of the best sunsets could be found on Skye at Neist Point or a spectacular sunrise overlooking the Old Man of Stor. Following the coffee break, Don took us on a whistle stop tour to some of his favourite locations in the Lake District, once again photographed in beautiful light. The large audience all agreed that it had been a very inspirational and enjoyable evening.